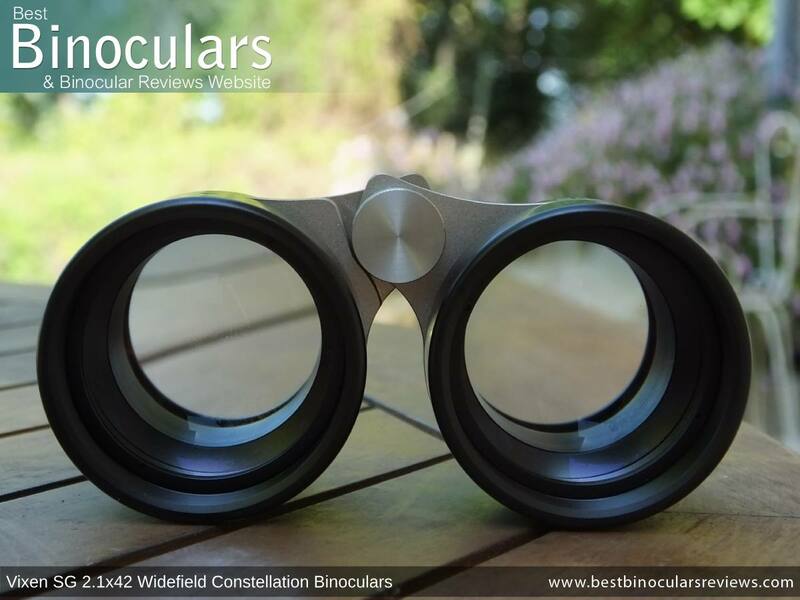 Dubbed the Constellation Binocular, the 2.1 x42 Vixen SG Binoculars are made with astronomy in mind. 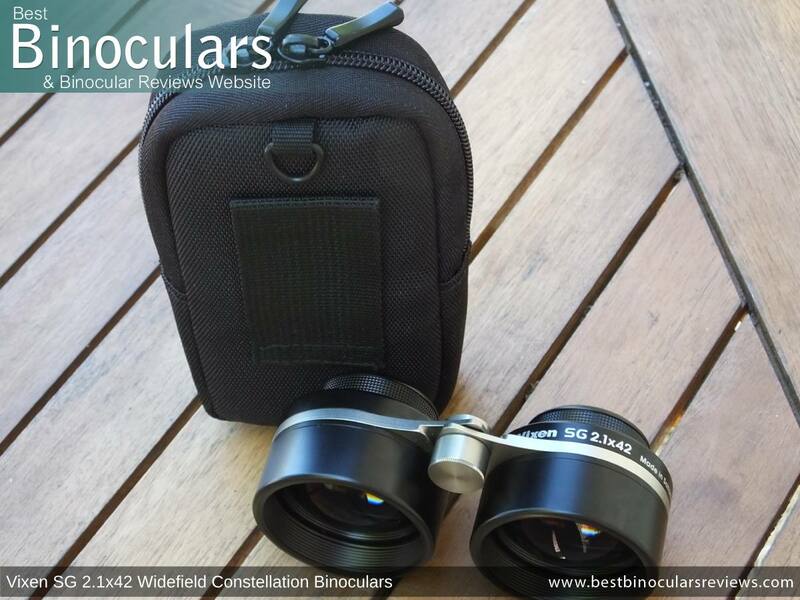 However, unlike most astronomy binoculars that have a high magnifications, this instrument with its low power and super wide field of view is designed to offer you a more rounded view of the night sky, allowing you to take in complete views of constellations and the milky way. 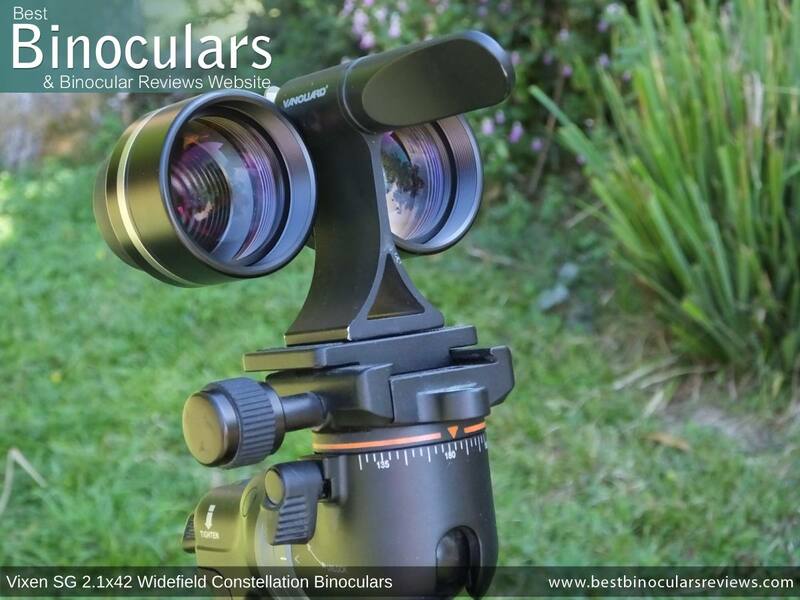 Good low light performance, wide field of view and a low power, it is also these main attributes that I think makes them more than just a stargazers binocular and I would put them forward as also being more than useful in a number of other areas including as theatre or opera glasses, a binocular to take to a museum or art gallery, for some outdoor sporting events and they could be a great optical aid in the study of flowers and insects. With all this in mind, I decided that they would be really interesting to test in all these areas and so I arranged to have them sent out to me to review. I would like to thank First Light Optics for very kindly loaning me these binoculars to test. 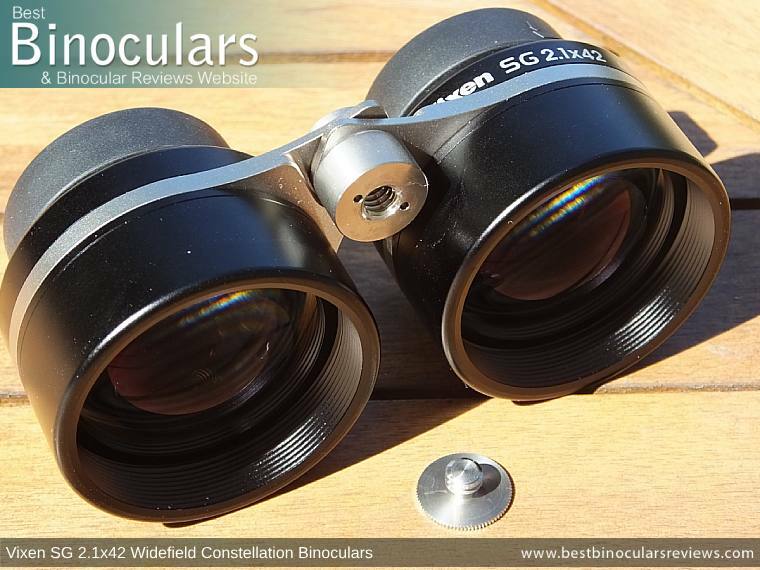 As well as these Vixen SG 2.1x42 binoculars, they also stock a huge range of binoculars, scopes, telescopes and a lot of other related equipment for astronomy, birding, marine observation, wildlife observation, and general use. 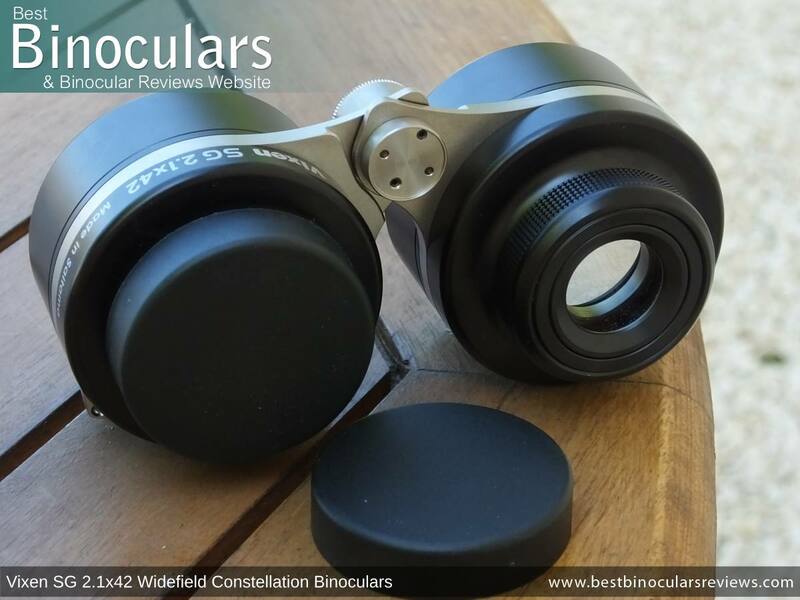 Many people assume that the higher the magnification the better, this is especially the case when it comes to viewing distant stars at night and so you may be wondering why would you want a binocular for astronomy with such a low power? Well, the main reason is that the drop in power means that your field of view completely opens up. Thus for astronomy, this results in being able to take in and enjoy entire constellations and more of the milky way without having to pan the view about. Apart from the pleasure of seeing the entire group of stars, this super wide field also makes it much easier to navigate your way around the sky. So why use binoculars at all? With your naked eyes, the field of view you have is incredible, so many of you may be wondering why not forgo binoculars completely and simply use the 1x power of your eyes? The answer here is that the 2.1x magnification of the image offers the equivalent improvement of magnitude of about 1.5x when compared to naked eye viewing. This results in you being able to see far more stars than is possible without them and thus they give you a far better view of the night sky. 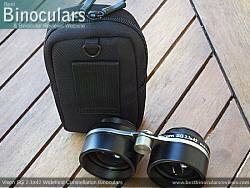 So whilst I would not recommend these as an instrument to take the place of your high powered binoculars and telescopes, they have their place and certainly are great to use alongside them. The fact that they are so small also make them ideal to take along on a camping trip or any other time that you are going to spend some time under the stars at night. There is no denying that with their large 42mm objective lenses and extremely short body, the Vixen SG Constellation binocular is a somewhat unique looking instrument. This short body does take a little getting used to in terms of holding it and you have to be careful that some of your fingers don't fall in front of the objective lenses and spoil the view. But this is just a case of getting used to them and not really a problem. I like the fact that the lenses are set back very deeply (about 10mm) from the ends of the barrels as this offers them plenty of protection. The fact that the insides of the barrels have a whole series of small baffles that begin right from the outer edge and continue right into the instrument is not by accident. Like those used in a recording studio to reduce sound bouncing around and thus echoing in the room, they are designed to reduce unwanted light reflections which would reduce both image quality and contrast. The two barrels are held together by a single and very thin aluminium bridge. Whilst not bulky at all, the construction of this feels really robust and the hinge at the center opens and closes very smoothly, but with a good amount of resistance so that they remain at your desired IPD setting to match the distance between your eyes. With a minimum of 5.5cm (2.1in) and a maximum of 7.4cm (3in), the IPD (Inter-Pupillary Distance) range on these Vixen SG 2.1x42 binoculars is fairly wide and pretty much the same as you would expect to get on a standard 42mm binocular. Vixen Optics does not make any mention as to if the SG is sealed and thus waterproof, so I will assume that it is not. If so, this also means that they will not be fog protected and is something to keep in mind should you take them out of your warm house on a cold winters evening. Unlike the folding or twist-up/down eyecups that most people will be familiar with on standard binoculars, the simple rubber eyecups that come with the Vixen SG binoculars are detachable and simply slip over the eyepieces and held in place with the dimpled serrations etched into outer surface of the eyepieces. You can make small alterations to the level of eye-relief by how far you push the cup down onto the eyepiece, but in reality I found that I got the best results with the minimum level of relief and so even without glasses, I fully depressed the cups. 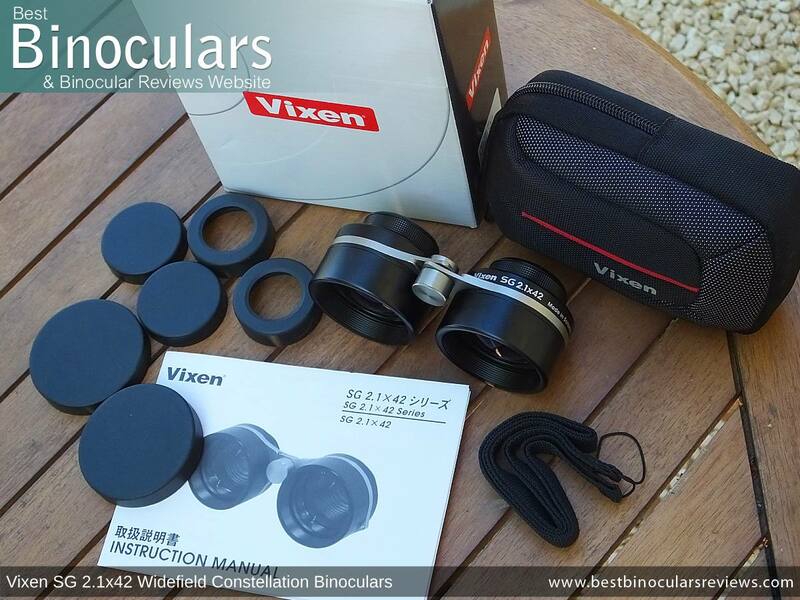 These Vixen binoculars have an individual eyepiece focusing system and thus to focus them you turn each eyepiece separately. The advantage of this system is that like a diopter on a binocular, by focusing each side independently you are essentially calibrating the instrument to match your particular eyesight and thus if your sight for each eye is different, these will allow for that imbalance. It also means that for long range uses like stargazing where you will essentially set up the device for infinity focus, once you have calibrated them, no further adjustments are necessary. This is unless you decide to focus on nearby objects or share your optics with another user who perhaps requires a different setup. On the downside, having to adjust each eyepiece separately does take longer than a mechanism that adjusts both barrels simultaneously. The Vixen SG binocular is 'tripod adaptable' and by this I mean there is a small metal cover that you can unscrew located at the center pivot point on the bridge between the two barrels. Removing this reveals a standard thread which will easily accept a binocular tripod adapter. There will be many who will wonder why you would want to connect this instrument to a tripod. Being so small and light weight, there is no need to take any weight off your arms and with such a small amount of magnification, it is not at all difficult to keep the image steady when hand holding it. However I found attaching the SG to a tripod to be very useful for astronomy as I was able to line up a particular view and then step back and share it with other users without having to worry about them not pointing in the right direction. This was particularly beneficial when sharing views with my seven year old daughter and something that I would highly recommend. One point to keep in mind in regards to the choice of adapter that the distance in between the two barrels on the Vixen SG is quite small and thus you do need a narrow adapter. As you can see in the photo below, my Vanguard one worked well, but there are some designs of adapter that have a thicker leg, which will not fit. 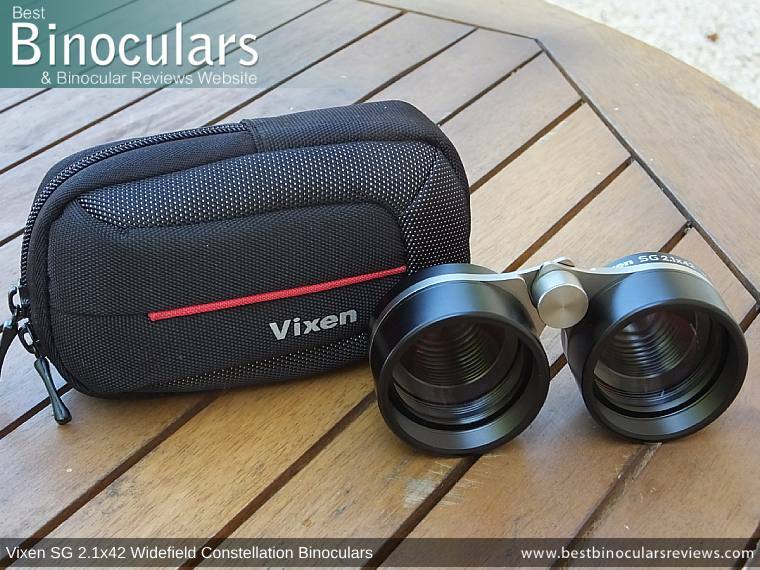 Despite their compact dimensions, at 14.5ozs (411g), the Vixen SG Constellation binocular is surprisingly heavy. However it is not overly heavy and besides, it is the result of them having an all metallic chassis, bridge and eyepieces. So I would go as far as to say that this weight really adds to the reassuringly solid feel they exude and you do get the feeling of holding a high quality instrument in your hands. This is in stark contrast to some of the cheap plastic opera glasses you currently find on the market and so I would say that this is a good thing. Whilst the width and height dimensions are fairly typical for a standard 42mm binocular, it is the length of these that is extremely short. This is made possible by the fact that they use the Galilean design that lacks any sort of prism. The Vixen SG 2.1x42 binoculars use the Galilean Optical system that is also popular with theatre and opera glasses. Lacking any sort of prism, it was first used by Galileo Galilei, way back in 1609 and is a basic, but effective way of magnifying an image by small amounts and thus ideal for this type of application. The large 42mm objectives on these binoculars serve two main purposes and some people may wonder why with such a large exit pupil (about 17mm) does Vixen Optics not reduce their size to make a smaller, more lightweight and potentially less expensive product. Well firstly with the Galilean Optical system, the width of the view that you see through the device is directly related to the size of these lenses and thus smaller objectives would result in a narrower view. Secondly, larger lenses are able to capture more light and thus more information with which to create a brighter, higher quality image. 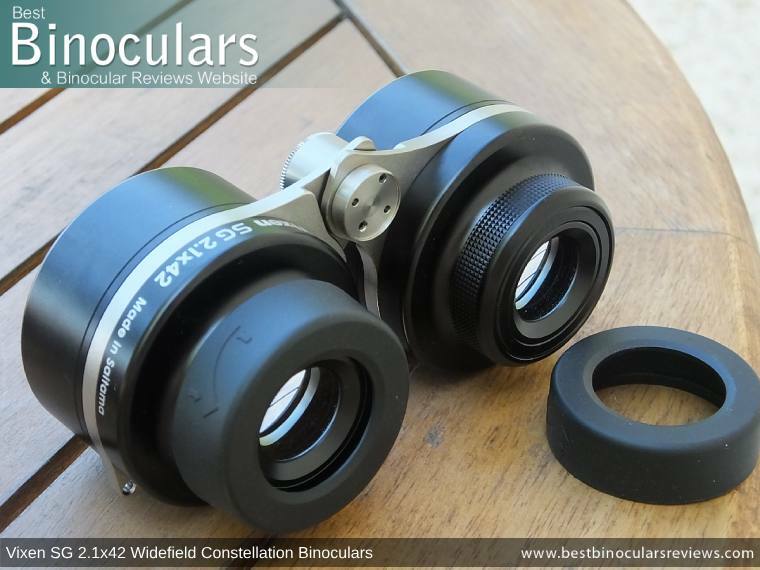 Responsible for magnifying the image, the exterior eyepiece lenses measure 17mm in diameter 22mm in diameter, which is fairly small if you were to compare them to your average 42mm roof or porro prism binocular. However, with the Galilean Optic system, larger ocular lenses are not necessary, this is especially true when you consider that the exit pupil is effectively the same size as this lens and thus your eyes are supplied with more than enough light, even when your pupils are fully dilated. This extremely large exit pupil also means that it is really easy to line your eyes up correctly with the light exiting the device and thus you don't have to search for the 'sweet spot' as you sometimes have to with usually cheaper, high powered prism binoculars that use relatively small ocular and objective lenses and which have small exit pupils. Every lens surface throughout the entire optical pathway on the Vixen SG binocular has multiple coatings of an anti-reflection material added to them and thus this device is described as being Fully Multi-Coated. This is good news as it makes a huge and noticeable difference to the brightness and quality of the image that is produced. 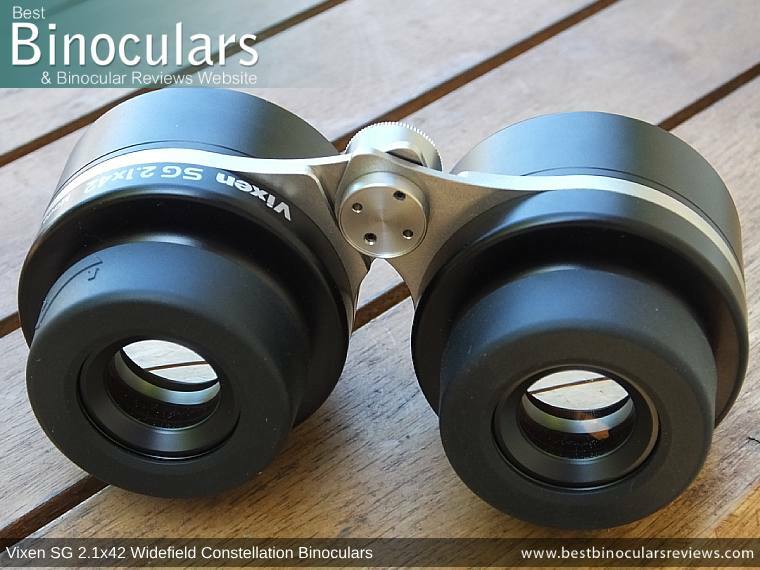 Lesser quality binoculars will only be Fully Coated (single coating on all surfaces) or Multi-Coated (multiple layers on some surfaces). For more: Anti-Reflection Lens Coatings. As well as their ability in low light, the main selling point of the Vixen SG 2.1x42 binocular is the incredibly wide field of view and is something that is especially usefully when using this instrument for astronomy. 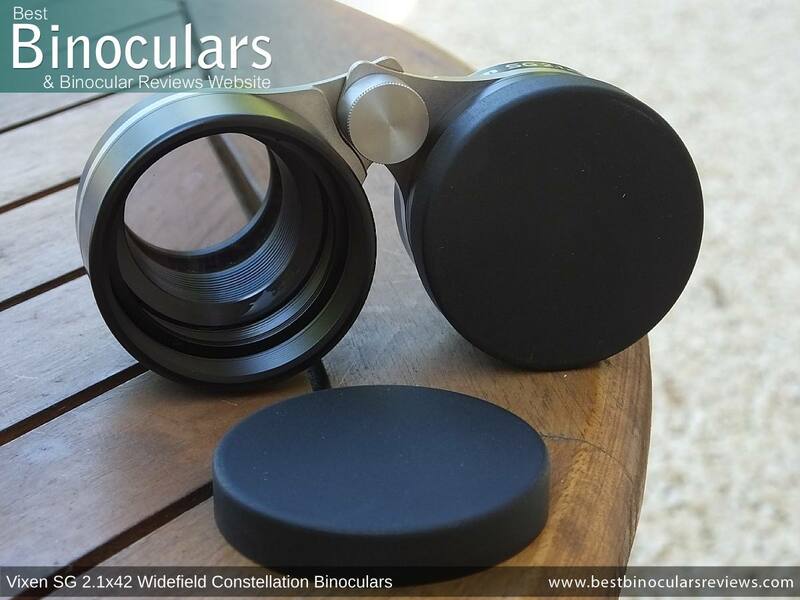 Advertised as a super wide 25-degree binocular, it means that you are able to take in many star constellations all at once. For example, it means that you are able to view all of Orion without having to move the view about as it spans 19 degrees and you can just about view all of the Plough at once (25 degrees across). Vixen Optics advertise these as having a minimum close focus distance of only 6.6ft / 2m, which for a 'normal' binocular I consider being excellent. However, it gets far, far better than that! By fully extending each of the eyepieces, I was able to focus on objects only 2ft / 60cm away! 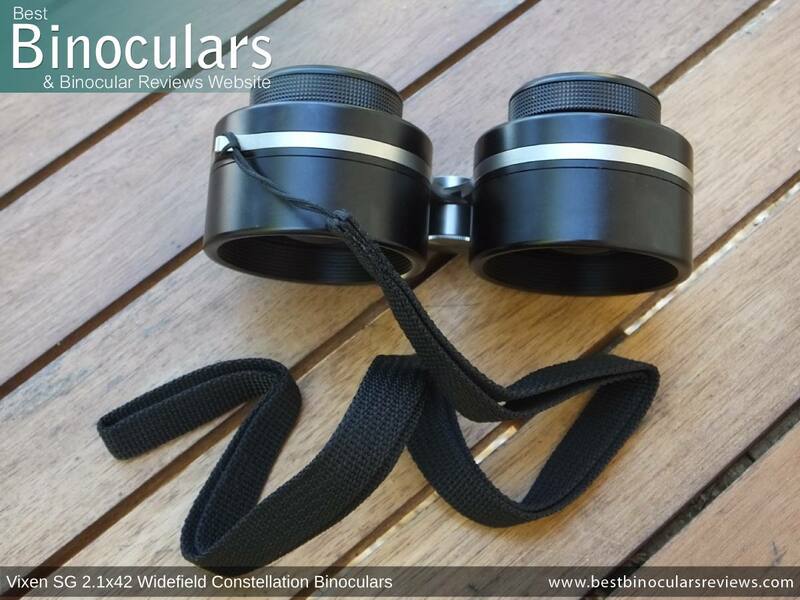 For the general nature enthusiast, these Vixen binoculars a great option should you also like to study things like Flowers, Butterflies and other Insects from very close range. 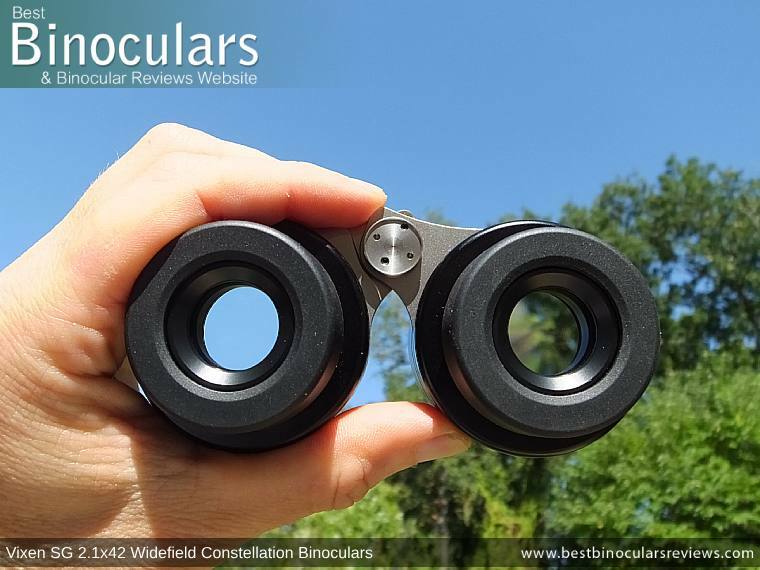 This minimal focus distance combined with an excellent low light performance also puts these forward as an ideal binocular for museums and art galleries and will allow you to closely study works of art and ancient artifacts. Their small compact size also means that they are easy to pack in your bag to take with. 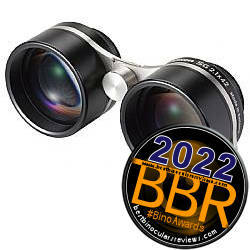 I have also had people write into me looking for binoculars for watching TV with. Apart from the minimum focal distance the problem with standard binoculars is that the magnification is just simply too high. Here I think these could really work for some users. Whilst my eyesight is such that I don't require any sort of magnification, but I tried them out and it really works a treat. The combination of the low 2.1x magnification, wide field of view and excellent close focus could make the Vixen SG an ideal choice for some users in this area. In their specifications, Vixen Optics state that these have 8.4mm of eye relief which is decent, but in no ways brilliant. I say this because for eyeglass wearers 16mm or more is usually recommended to ensure that you are able to take in the full field of view. However due to their particular Galilean optical design, even without glasses on, I found myself using the SG with my eyes set as close to the ocular lenses as possible. This is achieved by fully dressing or even completely removing the rubber eyecups. I tested the SG whilst wearing glasses. With them on, the distance between my eyes and the ocular lenses increases and as I could not move the eyecups any closer to the occur lenses the effective field of view that you can see decreases. So whilst still perfectly usable with glasses, you just have to accept that your field of vision will reduce. 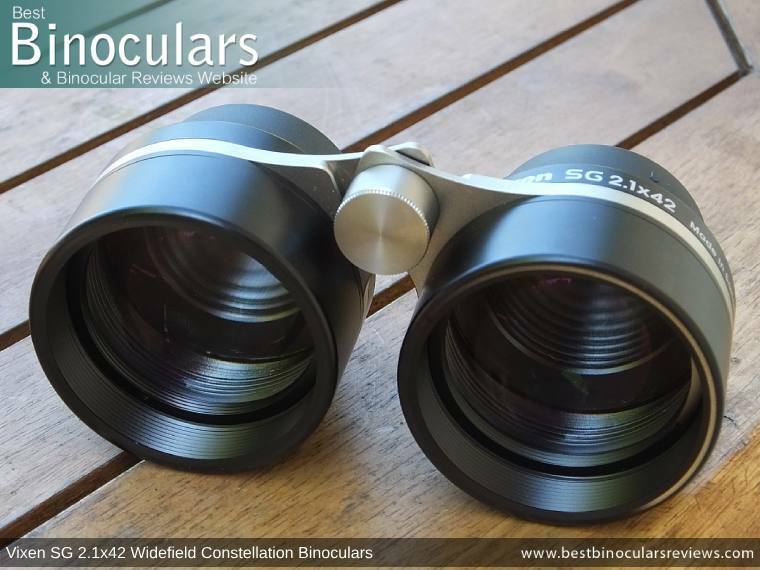 As you would expect from a binocular with good quality optical glass, a high level of anti-reflection coatings, no prism for the light to pass through, reasonably large objectives and a giant 17mm exit pupil, the image is both bright and they have an excellent level of performance in low light conditions. For the most part and in terms of the colors and the level of contrast, the image that you observe through these Vixen SG 2.1x42 binoculars looks pretty much true to life and I was not able to detect any sort of tinting to the image. Helped by the fact that the magnification is so low, the level of color fringing that you can observe through the Vixen SG binocular is extremely minimal and really nothing at all to be concerned with. The somewhat unique and incredibly wide field of view that you observe through these Vixen SG 2.1x42 binoculars is something that I really "learned" to appreciate, especially when using this instrument for astronomy. I used the word 'learned" because unlike your standard roof or Porro prism binocular where you can observe a well-defined field with sharp black rings framing the view, when you look through these Galilean glasses you actually observe the out-of-focus edges of the objective lens on the periphery of the view. Indeed from about 50 - 60% of the width, the further you move from the center of the view, the more the image quality drops off and the more curvature that you experience. For a Galilean optical design this is actually perfectly normal, but as I was so used to seeing an image without curvature and framed with a nice sharp black edge, this took a little getting used to. However, once I had learned to somewhat ignore the edges and look straight ahead, I really did appreciate the wide view that I was presented with. I would even go as far as to say that in my experience of using these, the drop off in image quality on the edges of the view is only part of you peripheral vision because the FOV is so wide and this actually added to the sense of immersion as you eventually almost forget that you are using binoculars as it looks so much like your normal vision. 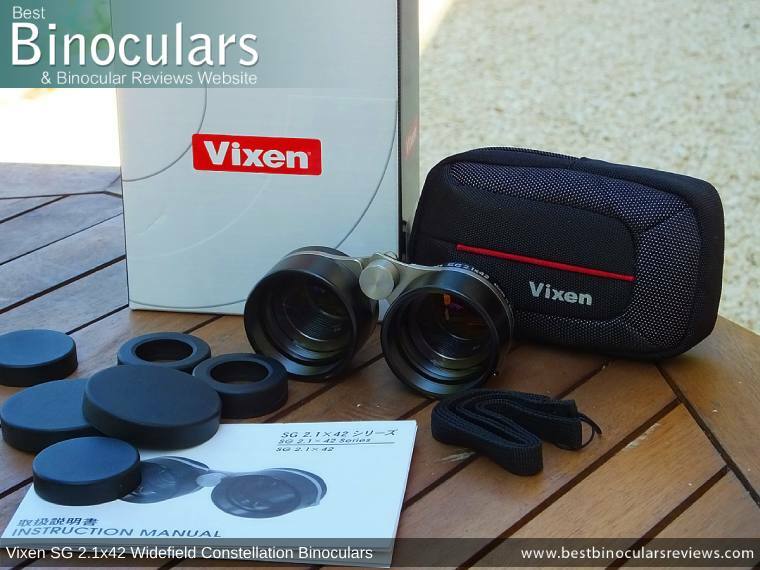 The view that you are presented with when looking through these Vixen SG Binoculars is very different to that of your standard 8x or 10x roof or Porro prism binocular, so it is hard and I think somewhat unfair for me to compare these to them. As I say, the softening around the edges takes some getting used to and is not a fault of their construction, but rather a particular aspect of the Galilean design. The brightness is impressive and the color reproduction and contrast is good, but not what I would call outstanding. These Vixen SG binoculars are supplied with a small assortment of accessories which includes a soft carry case, hand strap and lens covers for both the objectives and the oculars. Of all of the accessories, it is the dinky carry case that stands out. It is well padded and very well made and with the Vixen logo on the front, it is anything but generic. You gain access to the inside via a couple of Zips and the SG fits easily, but snugly enough inside. On the rear is a loop which you can attach the included hand strap to if you wish or just as easily, fix to your webbing or a belt via a crocodile clip. There is also a loop that you can thread your belt through, should you wish to carry it on your hip. However other than that, the other accessories are what I would describe as being perfectly functional, but pretty basic and somewhat generic. My sample did not come with a cleaning cloth, which is something that I would have expected. Although, having said that you are almost always better off using a lens cleaning kit anyway. 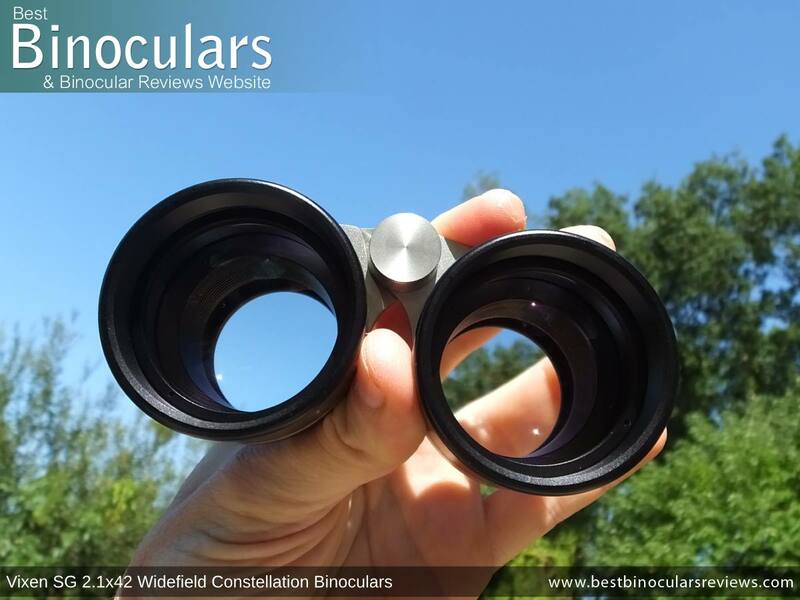 As a small, easy to carry and handle binocular for stargazing that does not require the use of a tripod, these are excellent and really do offer you a different and somewhat unique way of enjoying the night sky as well as being more than useful in a number of other areas, including making an excellent high quality pair of theatre glasses. The very wide field of view is what really stands out on these, it is indeed their particular strength and is what sets them apart from most other instruments. I really enjoyed being able to observe complete constellations and at the same time being able to see stars that were invisible to me with the naked eye. This does come with a slight caveat: As with every other pair of Galilean Glasses that I have used (mostly theatre and opera glasses), you do have to accept that you get comparatively more image softening on the edges of the view and there is more image curvature than what you would expect to find on your average roof or porro prism binocular. The all-around build quality and level of components used on these Vixen SG 2.1x42 Constellation binoculars is exceptional and you do really feel that you have a high-quality optical instrument in your hands. As I mentioned earlier, these come supplied with the same accessories as the Passion HD series, which if you consider cost almost three times as much as these, then you know you are a winner. I especially like both the quality and semi-rigid construction of the carry case and the neck strap is up there with the most comfortable that I have ever used. The minimum close focus distance that I was able to achieve was incredible and which opens these up to a whole host of other uses. From studying insects and flowers to assisting some people as a magnifying device to help them watch television or a computer monitor. Although this will depend on the specific problem with their eyesight. Whilst still usable whilst wearing glasses, there is no doubt that eyeglass wearers would prefer more eye relief which would allow them to maintain the entire field of view. Having to remove the rubber eyecups to replace the ocular lens caps on the Vixen SG 2.1x42 binocular can get a little tedious after a while and I eventually found that I either did not bother to use the eyecups or simply stopped using the covers, which is obviously not ideal.